Lili is a lesbian P.I. who stalks men cheating on their wives. When she’s not channeling Joan of Arc, Lili’s little sister Mary holds up a 7-Eleven and directs traffic. Their mother Eleanor, an archeologist, specializes in—what else?—the female brain. Claire Chafee’s comedy returns to Magic as sparkling as the day it premiered to packed houses in 1993. 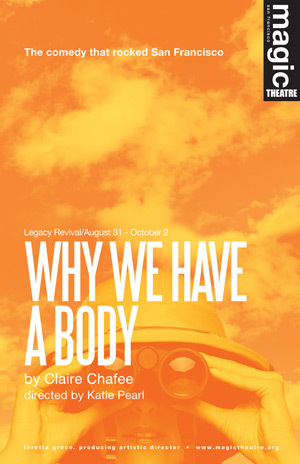 Claire Chafee’s play, Why We Have a Body, had its world premiere at Magic Theatre and went on to be produced Off-Broadway at the Judith Anderson Theatre by Women’s Project. It has been produced in numerous theatres around the country including Los Angeles, Seattle, Boston, Minneapolis, Dallas, Chicago, Florida and South Carolina as well as in Vancouver, Canada and Perth, Australia. Other plays include Even Among These Rocks, also produced at Magic, Darwin’s Finches, produced by Encore Theatre at The Thick House, Five Women on a Hill In Spain at the Minneapolis Fringe Festival and The Greene Theatre, Emerson, Boston and Whisper from the Book of Etiquette at New Georges, the Bay Area Playwrights Festival and New York Stage and Screen at Vassar. Her awards include a Drama-Logue Award, the Bay Area Critics’ Circle Award, a Princess Grace Special Projects Award, and the Oppenheimer Award from New York Newsday for Best Emerging Playwright. Her work has been published by Penguin Books, Smith & Kraus (Women Playwrights: The Best Plays of 1993), Alexandra Street Press, an online collection for scholarly research, and in the literary journals NuMuse and ZYZZYVA. She is a member of The Dramatists Guild, and holds an MFA from Brown University and an EdM in arts education from Harvard University. She teaches graduate creative writing at California College of the Arts (CCA). Katie Pearl (director) makes site-specific performance and develops new works for the theater with playwrights and artists around the country. With long-term collaborator Lisa D’Amour, Katie has directed or performed 15 projects including the recent durational performance installation How to Build a Forest, presented by The Kitchen in June 2011, in collaboration with New Orleans artist Shawn Hall. Past projects include Nita & Zita (OBIE award 2003), Slabber, Bird Eye Blue Print, The Cataract, and Anna Bella Eema. Katie is a MAP and Creative Capital funded artist, a member of SDC, a Drama League Directing Fellow, and remains a proud member of the new works theater community of Austin, TX. 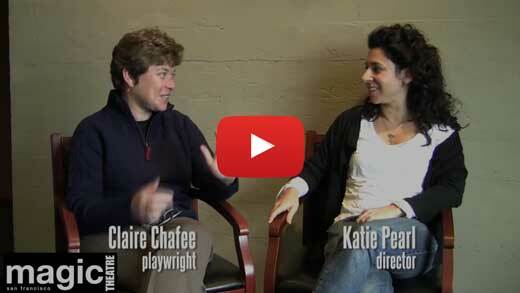 Katie is a member of Stage Directors and Choreographers Society, a national theatrical labor union. Jessica Holt (associate director) is thrilled to be back at Magic Theatre after directing Part 5 of Taylor Mac's The Lily's Revenge last season and The Laramie Project: 10 Years Later the season before. 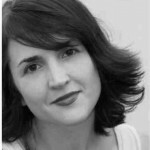 Jessica is a Bay Area director, producer and teacher and has worked with Boxcar Theatre, Cutting Ball Theater, New Conservatory Theatre Center, Playwrights Foundation, PianoFight Productions, Woman's Will, SF Theater Pub, Shotgun Players, and TheatreWorks, amongst others. She is Artistic Director of Three Wise Monkeys Theatre Company, which produces the Bay One Acts Festival annually and recently celebrated its tenth season. Jessica is also the Artistic Director and co-founder of Threshold, a theatre company that produces challenging, adventurous new work. A passionate advocate for arts in education, she currently teaches theatre at West Valley College. Jessica holds a Master's degree in Performance Studies from University of California, Berkeley. Rebecca Dines* (Renee) is delighted to be back with Magic where she was last seen in Claire Chafee’s Even Among These Rocks. She recently appeared as Pamela (et al) in TheatreWorks’ production of The 39 Steps. Other TheatreWorks roles have included Lily Garland (Twentieth Century), Alexa Vere de Vere (As Bees In Honey Drown), Rosalind (As You Like It) and Puck (Shakespeare In Hollywood). She appeared for Kansas City Repertory Theatre in the one-woman show Bad Dates and the San Francisco and Lake Tahoe Shakespeare Festivals where her roles included Beatrice (Much Ado About Nothing), Kate (Taming of the Shrew), Helena (A Midsummer Night’s Dream) and Lady Macbeth (Macbeth). In Lake Tahoe she was thrilled to also direct a production of As You Like It. Her favorite roles include Ruth (The Homecoming, Aurora Theatre Company) and Lorraine Sheldon (The Man Who Came To Dinner, TheatreWorks). She has appeared for Berkeley, San Jose, and South Coast Repertory Theatres, The Laguna Playhouse and in theatre and television in Australia and London. 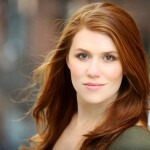 Lauren English* (Lili) Lauren most recently worked on The World Premiere of The Proud at Studio Tisch New York. 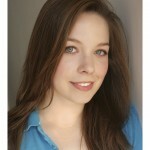 Before that she was back in the The Bay playing Kelly in World Premiere of Reborning by Zayd Dorn at The SF Playhouse. New York Theatre: Celia in TACT's Off Broadway Production of The Cocktail Party, Ophelia in Hamlet at The NJ Shakespeare, and Sally in The Idealist at The Times Center (with Allison Pill and Tony Roberts). She has also worked at The Public Theater, The Ensemble Studio Theatre, The Lark, The Playwrights Realm, among others. Locally, she has worked at The California Shakespeare Festival, Word For Word, Marin Shakespeare, and is a Proud Founding Member of The SF Playhouse. Favorite SFPH roles are: Sally in Cabaret, Emily in Our Town and Lisa in The Glory of Living. She is a two time BACC award winner and three time Dean Goodman Award Recipient. A proud member of AEA. She holds a MFA From NYU's Graduate Acting Program. Lorri Holt* (Eleanor) Lorri was last seen at the Magic in Rebecca Gilman’s The Crowd You’re In With. Other Magic credits: Hillary & Soon-Yi Shop For Ties by Michelle Carter, and Three Hotels by Jon Robin Baitz. Ms. Holt has been a leading actress in Bay Area theatre for more than three decades, performing leading roles at Berkeley Rep, A.C.T., California Shakespeare Festival, San Jose Rep, TheatreWorks, Marin Theatre Company, and in many commercial productions. This spring she played Emily in the world premiere of Reborning at SF Playhouse, where last year she portrayed Ilana in Rajiv Joseph’s Animals Out of Paper. Lorri was a member of San Francisco groundbreaking Eureka Theatre, where she originated numerous roles, among them Harper Pitt in Tony Kushner’s Angels In America. Other regional theater: The Humana Festival at ATL; Birmingham Rep (England); La Jolla Playhouse and London’s Barbican Theatre. She is the recipient of numerous acting awards and honors. Film/tv credits include: Back To The Streets of San Francisco, Bee Season, Patch Adams, Baby Steps, and the upcoming Love & Taxes. 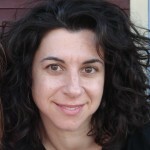 Lori holds a BA in Dramatic Art from UC Berkeley and an MFA in Writing & Literature from Bennington College. Maggie Mason (Mary) New York credits include: Iole / Tecmessa in These Seven Sicknesses and Ensemble in Arok of Java with dir. Ed Sylvanus Iskandar. Bay Area: Or, dir. Loretta Greco (Magic Theatre) for which she was nominated 'Best Actress' in the Bay Area Critics Circle Awards; You, Nero dir. Sharon Ott and Arabian Nights (understudy) dir. 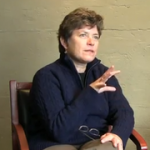 Mary Zimmerman (Berkeley Repertory Theatre); Rock and Roll dir. Ken Kelleher (San Jose Stage); Possibilidad dir. Wilma Bonet (San Francisco Mime Troupe); Hamlet and As You Like It dir. Ken Kelleher (Pacific Repertory Theatre); Future Me (TheatreFIRST); Translations, and The Collection dir. Ed Sylvanus Iskandar (Stanford Summer Theater); Oskar the Bully dir. 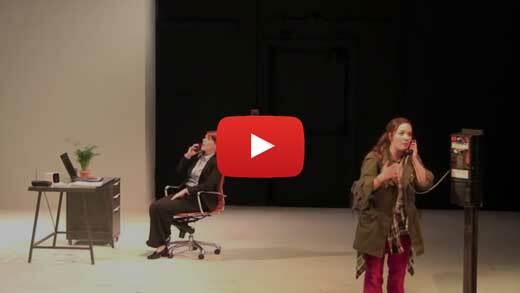 Mary Sutton (TheatreWorks); The Heavy Hand dir. Noona Nolan (Stage Werx). Film: Mirad, a Boy From Bosnia dir. Jeremy Irons (starring Jeremy Irons and Sinead Cusak). Television: Grange Hill (BBC TV), lead (three seasons). Maggie holds a B.A. in Drama from Stanford. Angela Nostrand* (Stage Manager) is thrilled to return to Magic Theatre. Recent credits include: Evie’s Waltz, K of D: an urban legend, Tir na nog, The Crowd You’re In With, Expedition 6, The Long Christmas Ride Home, and The God of Hell (Magic Theatre); Octopus (Encore/Magic); Skin (Encore/Climate), T.I.C. Trenchcoat in Common (Encore); The Eccentricities of a Nightingale, Speech & Debate, Fat Pig, Bosoms and Neglect, Private Jokes, Public Places, and The Price (Aurora); Restoration Comedy (Stanford Summer Theater); Three on a Party (Word for Word); Charlie Cox Runs with Scissors, 9 Circles, and The Pavilion (Marin Theatre Company). Marsha Ginsberg** (Set Designer) Recent work: Habit by David Levine; (Luminato Festival, Mass MoCA, Watermill Center); Blue Flower (American Repertory Theater, Elliot Norton Design Award). Obie-award winning Telephone (Foundry Theatre, NYC); Lascivious Something (Women’s Project/Cherry Lane); Bleakhouse (Bauhaus Festival,Theaterhaus Jena); Kafeneion (Athens/Epidaurus Festival); Knock-Out (Thalia Theater, Hamburg, Theaterhaus Jena). Opera: with Ken Rus Schnoll: It Happens Like This (Tanglewood Music Center) and Proserpina (Spoleto Festival USA); with Christopher Alden: Phaeton (Saarlindishes Staatstheater); Die Entfuhrung aus dem Serail (Theater Basel); Imeneo (Glimmerglass Opera); Carmen (Nationaltheater Mannheim); Serva Padrone, Rita & Le Pauvre Matelot (San Francisco Opera); In Mahler’s Shadow (Eos Orchestra); with Roy Rallo: Ariadne auf Naxos (Opera National de Bordeaux); Methusalem Projekt; Don Pasquale (Nationaltheater Weimar); La Finta Giardinera (San Francisco Opera); Elektra; Bluebeard’s Castle (Long Beach Opera),. Exhibits: Pavlov’s Lab and other rooms, Solo at Gallery Magnus Muller, Berlin; Design Life Now National Design Triennial, Cooper Hewitt Museum, ICA Boston, Contemporary Arts Museum, Houston. Grants: NEA/TCG Early Career Design Fellowship; MacDowell Colony Fellowships. Ed: MFA NYU Tisch School of the Arts, Visual Arts at Whitney Independent Study Program; BFA Cooper Union. Obadiah Eaves** (Sound Desiger) Obadiah's music and sound appeared on Broadway in A Life In The Theatre; Collected Stories; Accent On Youth; Come Back, Little Sheba; The Lieutenant of Inishmore; and Shining City. His Bay Area work includes The Lieutenant of Inishmore, Yellowjackets, Heartbreak House, The Pillowman, and Nine Parts of Desire at Berkeley Rep, and The Pastures of Heaven at California Shakespeare Theater. He has written music and created sound for the original productions of works by Woody Allen, David Mamet, Eric Bogosian, Ethan Coen, and Suzan-Lori Parks. Awards: Lortel, Viv, and BACC. TV: HBO, Nickelodeon, Discovery, History Channel, TLC and Fisher-Price toys. His band, Big Hair, has released two CDs. * Member of Actors' Equity Association, the union of professional actors and stage managers. **Member of United Scenic Artists local 829, which represents the designers and scenic painters for the American theatre.